Figure 7-15. - Piles pulled by heaving deck. properly to eliminate reflection cracking and subsequent premature failure of the new asphalt surface cover. Liquid asphalt is applied to the surface of the portland cement surface as a primer, and a dense graded mix of asphalt concrete or sheet asphalt is laid as a surface according to a predetermined design. A partial remedy to protect concrete from chemical deterioration is to apply a layer of dense impervious concrete properly anchored to the old work or some of the newer materials, such as epoxy resin formulations. Free standing components of structures damaged or deteriorated by such means as spalling or longitudinal or horizontal cracks in tiles and bracing can be repaired above the waterline. Pressure-applied mortar, epoxy formulations, normal portland cement concrete, or grout are the materials used. Encasement of damaged portions in reinforced concrete is the conventional method of repairing piling. It is always preferable to place concrete in air if economical and feasible; however, this requires the use of cofferdams, and it is not always an economical solution. When the solution dictates, concrete can be placed under water. Forms may be used, as shown in figures 7-16 and 7-17. Figure 7-16. - Encasement of damaged piles (wood form). 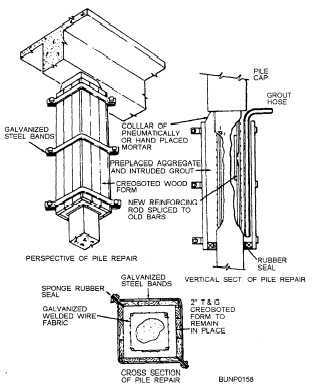 Additional reinforcing in the form of rods or mesh is placed around the damaged pile, and sectional forms are used to hold the concrete in place until it cures. Forms may be made of pipe, sheet metal, or wood and are split in half vertically so that they can be placed around the tile and bolted together above the water. Each section is then slid into place and new sections added until the desired length is obtained. The form is then filled with concrete. Forms may be left in place or removed for reuse. 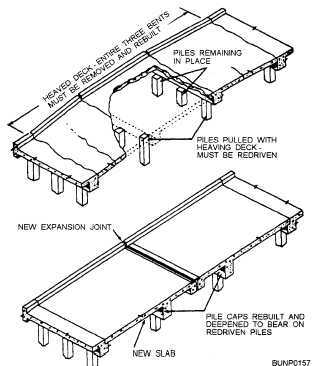 Where only a section of the pile is to be encased in concrete and the forms do not extend to the mud line, the lowest section of the forms must be closed to hold the concrete or aggregate and grout in place. (See fig. 7-17.) Pressure-applied concrete may be used to make sectional forms. These are built upon cylinders of expanded metal laths shaped to fit around the pile. Wire mesh reinforcement may be used outside of the metal lath where additional strength is required. Pressure-applied concrete is used to make a sectional form 1 or 2 inches thick, and the concrete is allowed to set. This form is then dropped into place and filled with concrete.